Sun, Feb 10, 2019, 10:57 am SL Time, ColomboPage News Desk, Sri Lanka. 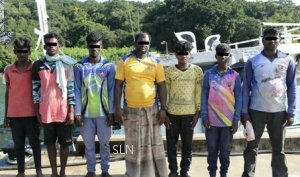 Feb 10, Colombo: Sri Lanka Navy has arrested seven Indian fishermen for allegedly breaching the International Maritime Boundary Line (IMBL) and illegally fishing in Sri Lankan territorial waters in the East on Saturday. Naval personnel attached to the Eastern Naval Command during a naval patrol in the seas off Kokkuthuduvai area in Pulmoddai arrested the Indian fishermen along with their dhow. The apprehended fishermen were brought to the Naval Dockyard and produced for a medical test before they were handed over to the Assistant Director of Fisheries in Trincomalee for onward legal action, the Navy media said.